A new poll conducted by Insightrix Research in partnership with 680 CJOB and Global TV Winnipeg suggests there has been a recent surge in those intending to vote for Brian Bowman in the upcoming municipal election on Wednesday. Specifically, among decided voters (71% of those who intend to vote), 38% say the plan to cast their ballot in favour of Brian Bowman while the poll suggests that long-time leader throughout the campaign, Judy Wasylycia-leis, will receive 36% of the votes. 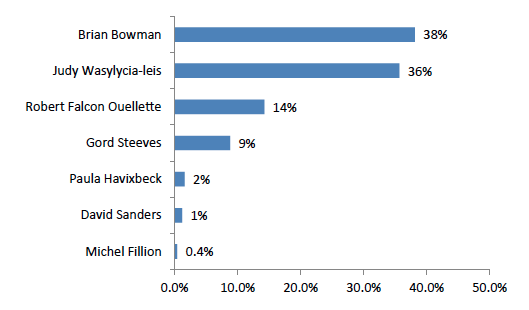 Robert Falcon Ouellette (14%) and Gord Steeves (9%) trail behind the two front-runners while very few intend to vote for Paula Havixbeck (2%), David Sanders (1%) or Michel Fillion (0.4%) on October 22nd. Where did the votes change? Findings from this poll are in stark contrast to a similar poll conducted by Insightrix Research, 680 CJOB and Global TV in late August and early September where 38% say they were planning to vote for Wasylycia-leis, 24% for Bowman and 20% for Steeves. Since that time, far fewer Winnipeg residents say they plan to vote for Steeves which appears to have largely accounted for Bowman’s rise in the current poll. The poll shows that 29% of those who intend to vote are undecided as to who they will vote for. This combined with the neck and neck performance between Wasylycia-leis and Bowman means that the election is too close to call. As with many elections, the winner will be determined by the candidate that does the best job at getting out the vote on Election Day. A total of 802 randomly selected Winnipeg residents were polled by telephone between October 7th and 17th, 2014. Quotas were set by age, gender, and by postal code groupings and data are weighted to match the distribution of the population of Winnipeg. The margin of error is equal to ±3.5 percentage points, 19 times out of 20. Insightrix Research Inc., established in June 2001, is a full-service Canadian market research company that provides consulting services in study design, questionnaire development, data collection, qualitative services, and data analysis. Insightrix also owns and manages ManitobaWatch™, an online panel that is comprised of Manitoba residents who provide input on local political, social and consumer issues. For more information, please visit http://manitobawatch.ca/.